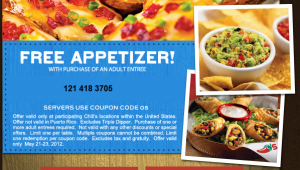 If you’re taking a break from cooking tonight and you’re heading to Chili’s, grab your coupon for a free appetizer with the purchase of an adult entree! We LOVE the Southwestern egg rolls and the skillet queso! NOTE: This coupon is valid through Wednesday, 5/23/12. This offer cannot be combined with any other offers. Limit one per table. 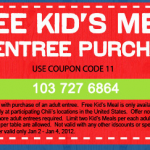 FREEBIE ALERT: Kids eat FREE at Chili’s through 1/4! 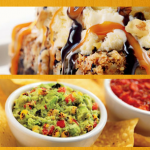 Chili’s: Kids eat free 3/5-3/7! 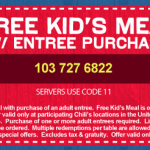 Chili’s: Kids eat free 5/7-5/9! 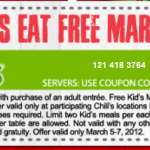 Chili’s: Kids Eat Free through 4/25!